There weren't quite as many fans as we'd hope to see in Austria, some of the grandstands looked particularly empty, but those that were there were treated to a good show. Firstly, the racing was awesome, but also, there was some great antics by the drivers. Lewis Hamilton, in particular, spent a long time greeting and signing autographs for his fans. That's the nice side of the guy, there's also the side that allegedly beats up innocent motorhome rooms when things don't go his way. That, and so much more, is up for points in this week's rankings round-up. Who will lead the standings at this halfway point of the year? +1 Esteban Gutiérrez: Just a bonus point here for thinking particularly highly of himself in this comparison with Robert Downey Jr.
+2 Jenson Button: Anything to sell a ticket, Button promises a McLaren victory at Silverstone. +5 Daniel Ricciardo: Waltzing Sky's Tanja Bauer around the studio floor, with exactly the right grin to be a ballroom dancer. -2 Max Verstappen: No one should parade around in lederhosen in the F1 paddock, let alone fake-lederhosen overalls. 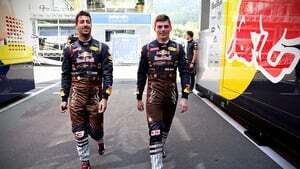 -2 Daniel Ricciardo: No one should parade around in lederhosen in the F1 paddock, let alone fake-lederhosen overalls. +1 Jolyon Palmer: Love a driver who isn't afraid to tuck into a bit of cake - looks yummy! +2 Lewis Hamilton: Usually I'd frown at the violence, but points for Lewis for creating a bit of excitement during the Austrian Grand Prix weekend - "destroying his room" in Hulk like fashion. +1 Marcus Ericsson: Nice of Marcus to thank the fans for supporting him, there was a good contingent rooting for him in Austria. +2 Lewis Hamilton: Spending a long, long time signing autographs for the fans in Austria.